Last week we posted a small fraction of the final looks you girls have been posting on your feeds, and got such a great response, we just had to post another weeks worth! If after this blog you are still excited to see more, let us know! We also want to know your favorite looks from this season! What shapes and colors most appealed to you? We would love to hear from you - simply leave a comment below! Now for the fun part: the dresses! Screenshot and save your faves for ideas for your Prom appointment next season! 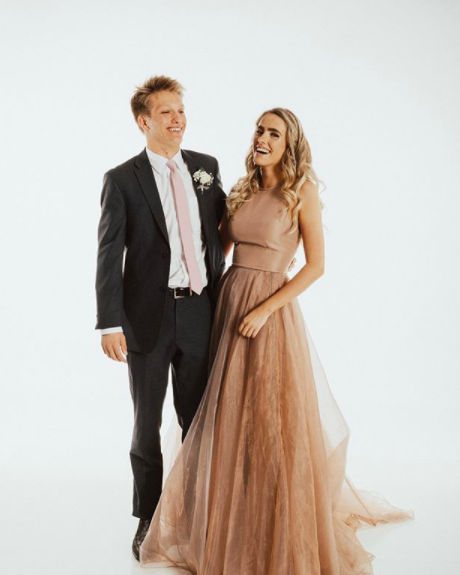 Tayler looked STUNNING in this blush Sherri Hill ballgown! With white lace applique and this gorgeous open back, we are obsessed. We love her elegant hairstyle half up, half down, showing off the pretty details and neckline of the dress! Tayler, thank you for shopping with us! We loved helping you at Homecoming & it was a pleasure to work with you again for Prom! Meet Maycie! This was our first time meeting Maycie as it was her first Prom, and can we just say... the drama and beadwork on this dress are so unique! 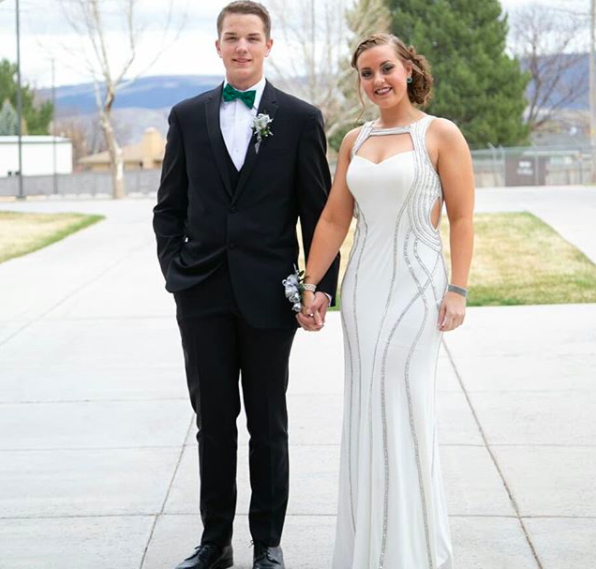 She said, "I loved the entire experience from shopping for my dress at Ypsilon to being a part of the committee that created my High School's Prom this year; it made it all that more special to me. I also got to enjoy the experience alongside my best friend." Meet Aspen! Yet another white dress, the flowiness of the skirt and detail in the beadwork make this the perfect dress for Prom! Aspen said, "I loved Prom because it was at the Capitol and I got to dance with all my friends for my last dance!" Thanks for shopping with us Aspen, you looked gorgeous! THIS. PRINT. You guys, the giant red rose floral is amazing! One of Sherri Hill's signature looks this season and Maleea is absolutely rocking it. About Prom this year, she said, "For once, everything was perfect. My school had been going through a ought time period in the weeks leading up to Prom; everyone was down and life had lost its lust. However, Prom was an escape from all this! A night where everyone truly felt and looked beautiful: a night of joy and laughter. Prom was simply a night to remember." This girl is gorgeous in pink floral print! Last year, her Ypsilon Prom dress was a gorgeous floral two-piece, and we love this one just as much. Sherri Hill is always incredible, year after year! Thanks for shopping with us Aspen! We have loved getting to know Jacqueline as she has modeled for us in various fashion shows, and while she shopped for her Prom dress! This color was made for her skin tone and the style was one of the most unique and beautiful combinations we've seen Sherri bring. Jacqueline said it perfectly that: "Prom was so special to me because I decided to go out of my comfort zone with my dress and I felt like princess Jasmin." We LOVE when girls push the limits and wear something truly spectacular. Thanks for visiting us again Jacqueline! Oh this champagne color paired with an iridescent flowy skirt! Kaitlyn looks amazing, and commented that "My dress made me feel like a Princess, and I was surrounded by my closest friends! It was an experience I'll never forget!" Sydnee is definitely one of our favorites and we KNOW we're biased. Sydnee is staff here at Ypsilon and we are so grateful for her! Plus she looks incredible in Sherri Hill... are we right? This dress has so many perfect elements from the shape, print, train, color, 2 piece, and especially the back! Tap to scroll to see! Hello gorgeous! Payton is stunning on the inside and out, and we love this dress on her! The shape of the dress is elegant and fits her perfectly, with subtle but ever-so detailed beading on the skirt. We love! 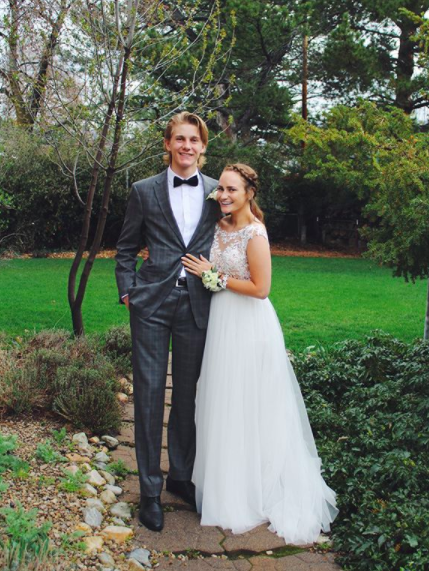 Payton said, "I loved Prom this year because I felt like a Princess in my dress and had an amazing time with my date!" Morgan is gorgeous in this dress! Stating that, "Prom this year was a night to remember," we would have to agree that her dress is something to remember, too! This light blue is so elegant and regal with the coverage and lace. We LOVE! Charcoal grey is always a stand-out favorite color amongst our staff, and you can see why! This color looks fantastic on Lexie and we love the tulle ballgown paired with a detailed beaded bodice. Thanks for shopping with us, Lexie! Emma looked amazing in not one, but two gorgeous floral print dresses for her Prom(s) this season! Also can we talk about her dress having pockets? This is, without a doubt, the most exciting detail that Sherri adds on most of her ballgowns and we love it! So what do you girls think? Are final looks your favorite, too? We might be featuring even more clients in the near future, so if this is something you are interested in, comment below or send us a DM with interest! We love getting your photos and are so happy to repost you gorgeous girls. Stay beautiful, shine on, and stay tuned for more great content coming your way!